Born in Kiev, Ark Ovrutski began playing violin at age 8 – influenced not by classical music but by his father’s love of American jazz stars Duke Ellington and Ella Fitzgerald. 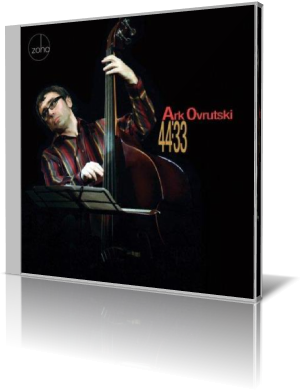 Now, Ovrutski releases his third album as a leader, 44:33 (Zoho Records, 2014). Ovrutski plays double bass. With him are trombonist Michael Dease, saxophonist Michael Thomas, pianist David Berkman and drummer Ulysses Owens. Benito Gonzalez plays electric piano on one track. The set begins in Bourbon Street fashion with “New Orleans.” Owens’ gumbo drum play mixes well with Berkman’s piano. Thomas plays the soprano on this track, alternating lines with Dease. During one sequence, the two horns sound like police sirens. Then they overlap with independent melodies, like the Dixieland style. The pair then step aside for a moment, leaving things to the trio of Berkman, Owens and Ovrutski. All three stretch out plenty, complementing one another. The horns return for the finale. Thomas uses the soprano again on the happy-go-lucky “Medium.” Trombone and sax blend for the melody. After Berkman’s solo, Thomas makes the soprano flutter, giving an impression of everything is good. Then Ovrutski gets his turn, snapping the strings with vigor. Dease follows the next sample of the melody with a bouncy, throaty performance. Ovrutski graduated with a degree from the Russian Academy of Music, where he roomed with trumpeter Alex Sipiagin. The title of 44:33 is the combined running time of the set. Ovrutski and his bandmates pack a lot of good sound into that time. He composed six of the seven tracks. He visited the United States in the early 1990s, later got a job at a jazz club in Krakow, Poland. He’s traveled “like crazy” for much of his adult life. With 44:33, it seems he’s found a home in CD players all over the world.